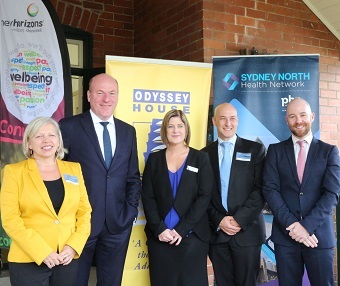 Northern Sydney residents impacted by alcohol and other drug addiction and mental illness will soon have enhanced access to free community-based treatment services through a partnership between leading rehabilitation organisation, Odyssey House, and local mental health services specialist, New Horizons. Funded by a landmark $1.09 million Federal government grant through the Northern Sydney PHN, Odyssey House Community Services will deliver psychological counselling and rehabilitation day programs to help people overcome drug dependence, manage mental illness, prevent relapse and access other local support services. Northern Sydney PHN Deputy Chair, Dr Harry Nespolon, said the Primary Health Network is proud to be launching a new treatment program to support people with co-existing alcohol, drug addiction and mental health issues in the region. “With the funding being part of the Government’s response to the National Ice Taskforce report, this innovative service will deliver a rehabilitation day program with psychological counselling, education and coordinated care support for its participants,” said Dr Nespolon. Odyssey House CEO Julie Babineau said the new service will provide residents with increased access to local specialist care and support, and make a real difference to improve people’s lives and the community they live in. “People in Sydney’s northern suburbs will now have access to a new integrated, local health service that treats their addiction and any mental illness simultaneously, enabling them to recover their health faster and access coordinated support. “Odyssey House brings 40 years of proven, specialist expertise in evidence-based treatment for drug dependence and co-occurring mental illness, while New Horizons is the largest provider of mental health services in NSW and has a significant presence in northern Sydney. “We’re all about making a real difference to measurably improve people’s lives and their communities – through empowering people to deal with any personal issues that may have led to drug dependence, building resilience and skills to deal with life’s ups and downs. “Partnering with New Horizons will now enable us to extend our reach and expand our services into the community to help people whose needs are best met by local day-based therapies rather than residential rehabilitation,” Ms Babineau said. Judi Higgin, CEO of New Horizons said: “We have a proud history of almost half a century of supporting people from all kinds of backgrounds to improve their wellbeing. These new services will give people the choice and control they need to reach their goals. We’re pleased to have the opportunity to partner with Odyssey House to provide these vital services and are excited to see the positive outcomes for both users of the service and the broader community. “We look forward to working with Odyssey House and New Horizons to achieve together better health and better care for people living in Sydney’s north,” concluded Dr Nespolon. In particular, Odyssey House Community Services will improve access and services for vulnerable groups including Aboriginal and Torres Strait Islander peoples, women with children, people from culturally and linguistically diverse backgrounds and people leaving the criminal justice system. The services will be available to residents in the Local Government Areas of Hornsby, Hunters Hill, Ku-ring-gai, Lane Cove, Mosman, North Sydney, Northern Beaches, Ryde and Willoughby. The first step to accessing Odyssey House Community Services will be a phone call or online enquiry to the Admissions and Intake Centre: 02 9281 5144 or www.odysseyhouse.com.au. In February 2017, SNPHN announced the successful commissioned organisations to deliver alcohol and other drugs programs.